This is an open letter to President Obama and our governmental officials, this was written by a young woman with FSH Muscular Dystrophy. Although his recent comments which compared his bowling skills to those of someone competing in the Special Olympics was not intended to offend, it does demonstrate our society's regard for people that suffer with handicaps. The letter I am sharing here is an appeal to those in government to support FSH Muscular Dystrophy research. Supporting FSH research today will provide people with this disabling condition hope that one day their dreams will not be beyond reach. What we do today will impact the lives of those diagnosed with FSH tomorrow. I have a good friend of mine who says, "No one ever dreams of growing up and competing in the Paralympics." This is not meant to be 'glass half empty' spiel. It is simply stating how life is living with FSH. As a kid you dream of becoming an Olympic athlete. The paralympics is amazing at that. It gives us something extremely challenging to strive for, but I think below the surface of the hardworking, 'glass half full' exterior our hearts break because the Olympic dream is out of reach. I was diagnosed with FSHD shortly after my 20th birthday. I knew for a good 5 years before that that something was wrong, and after being diagnosed looking back all the signs were there. I was unable to whistle, drink through a straw and I slept with my eyes partially open. It wasn't until over the last year that I have come to realize the devastating affect muscular dystrophy has had on my life. Although I try and keep a positive outlook and 'live' my life, thinking about how my disease is going to progress and how it has changed the course of my life leaves me feeling lost and helpless. My brain is programmed to be an athlete. I competed in athletics since I was very young and loved every minute of it. I marveled over gymnasts, for their absolute dedication to their sport. I loved the fact that they trained everyday for hours on end to perfect their craft. I was not a gymnast, but a volleyball player. But I took the same dedication and determination and lived for the day that I could devote everything I had to my sport. It became clear about my junior year that I was not progressing at the rate of my peers. In fact instead of peaking, I was declining. I was devastated, and for the life of me could not figure out what the problem was. I felt as though I was working twice as hard as everyone else, and yet my skills and endurance were getting worse. I finally convinced myself that my athletic goals were really not that important to me and that my heart just must not be in it anymore. Shortly after I was diagnosed. I continued to live in denial for the next 4 years about how FSH really affected my life. 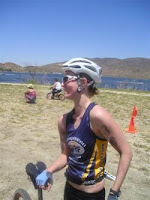 In the last year I have started competing in triathlon. I have been lucky to be a part of the Challenged Athletes Foundation and actually race against people of similar disabilities. I train every day with a stern voice in my head not to work to my potential. Because if I do, I might permanently loose muscle. It's a double edge sword. I have to compete for my soul, but I am also doing irreversible damage to muscle in order to do what my heart desires. Every day is a constant struggle to find a healthy balance. I will not have biological children. This has been a heartbreaking decision for me to come to. But with a 50/50 chance of having a child with FSH, I just wont dream of it. Bringing a child into this world, you want them to be able to do whatever they want to do. Not being able to do what my heart desires has been the hardest thing in my life. It haunts me every morning I wake up. And I would not be able to live with myself if my child had to go through the same thing. It is hard because looking at me it is not always noticeable that I have a disability. I think because of the nature of this form of muscular dystrophy it doesn't always get the attention it deserves. It's physical and emotional effects rival those of other diseases and dystrophy's, and yet it is not researched as other disorders are. I am asking you now to take a hard look into the lives of those who are diagnosed and their friends and family. I know you will find reason for more understanding into this disease. The funding for research must be restored to pre-Bush era levels, the support of the NIH is critical to advancing FSH Muscular Dystrophy research. Write to your representative - ask them to support greater research funding for FSH Muscular Dystrophy! To read more about this inspiring young woman please go to Kalynn's website & read her blog. She is hard at work raising money for FSH research - please support her STP ride in July 2009. Join her team! !